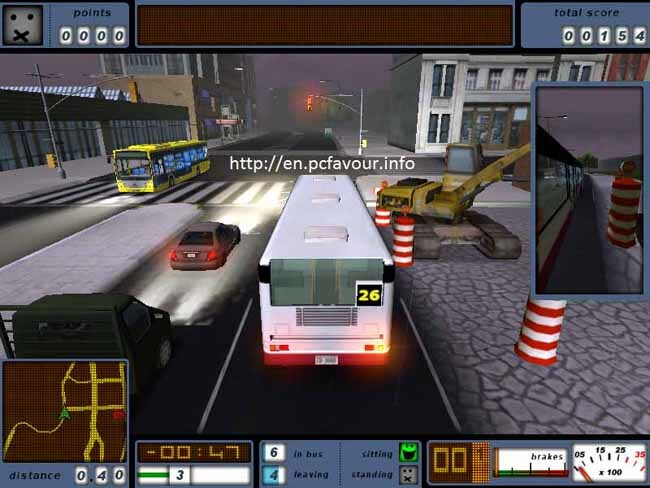 Free download Bus Driver Gold Edition PC game. It is a driving emulator PC game in which you feel yourself a driver. The game is developed by SCS Software. The gameplay is very easy and interesting. In this game, you have to select your bus. Each bus has its own route and stations. The game has some rules which you have to follow. There is also time counter for you to reach the destination. You destination is end station. The station on which you have to stop your bus has an orange stop box in which stop the bus and press “Enter” to open the door. Each stop has some passengers which you have to pick. Similarly, some of your pessengers will leave you on each station. You have to follow the traffic rules in Bus Driver game such as if you want to change the lane, you must blink you indicator using [ and ] buttons from keyboards. Similarly if the red signal is on you must stop the bus and wait for the signal to turn into green. If you are running bus at high speed and you press break suddenly then it will cause to add a penalty for you. There is a specific time for you to reach at each station. If you reach before the time then you will get some extra bonus. Moreover to reach the destination within time, your bonus will increase according to remaining time. You can set control options from Options menu. By default, you have to use arrow keys to accelerate, break, steer left or right. H key will use to turn Horn on. You can check all other options from control options and can change also accordingly.